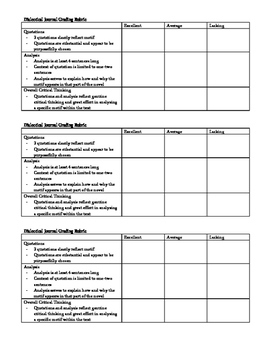 With this handout, you will receive directions for completing a Dialectical Journal, an example for students, a grading rubric, and a student sign-up sheet. 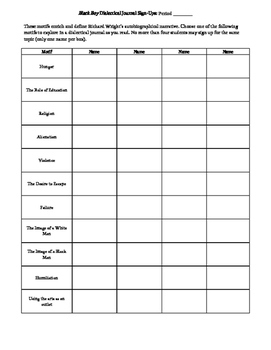 This Dialectical Journal assignment asks students to choose a motif and trace the motif's appearance and purpose over the course of a chapter (or section of pages you require). Students are asked to locate three examples of the motif and explain each one with thorough analysis. 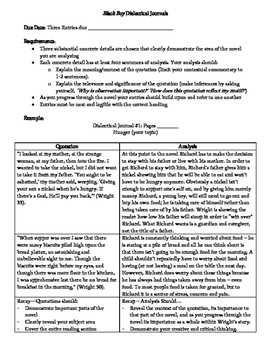 Students also have the opportunity to see a strong example on the handout, guiding their knowledge of what meaningful and substantial commentary looks and sounds like. The sign-up sheet lists 11 possible motifs -- like Image of a White Man and The Desire to Escape, allowing students to choose something that sounds interesting to them while also requiring that they survey a variety of ideas as they complete the text. I also like to limit the number of students tracking the same motif each week to limit opportunities for plagiarism, so the sign-up sheet works effectively for teachers as well.